Sir Edmund Hilary called it ‘the greatest survival story in the history of exploration’ – so why do so few Australians know about Sir Douglas Mawson? In the Heroic Age of Antarctic Exploration, mighty men with even mightier egos competed for fame and glory to be the first to achieve the seemingly unachievable. They wanted to sail further south, explore further inland and be the first to reach the South Pole. Most of these men, back then, craved for their moment in the limelight, to see their names cemented in history books for posterity and to be ‘crowned’ the best Antarctic explorer who ever lived. Then there was Sir Douglas Mawson, often described as one of the most courageous, committed and humble explorers Antarctica had ever known. He was an Australian. And this is his story. Douglas Mawson was born in the UK in 1882 and emigrated to western Sydney with his family when he was just a toddler. He studied engineering at Sydney Uni, graduating in 1902 and taking his first expedition in Vanuatu, as a geologist, the following year. His interest in the exploration of Antarctica arose quite early yet unlike so many who’d join him on expeditions, or travelled there concurrently, Mawson was primarily interested in the scientific discoveries that could be made on the newly-explored continent. Mawson’s passion for geology and mineralogy were unparalleled and his talent for teaching led him to a lectureship at the University of Adelaide when he was just 23 years old. Just a few years later, Mawson would join the ranks of more renowned Antarctic explorers, joining Scott, Shackleton and Norwegian Roald Amundsen to bag some seriously impressive exploratory achievements. Although, when it comes to Sir Douglas Mawson, they do come across as some kind of after-thought. A sweet consequence of his avid scientific research, if you will. Mawson was aboard Ernest Shackleton’s Nimroid Expedition to the South Pole in 1907, the first of what would be three Antarctic explorations for the esteemed British explorer. They were joined by Welsh-Australian geologist Edgeworth David – head of the scientific team – two petty officers, a Royal Navy lieutenant and at least a dozen other crew members. 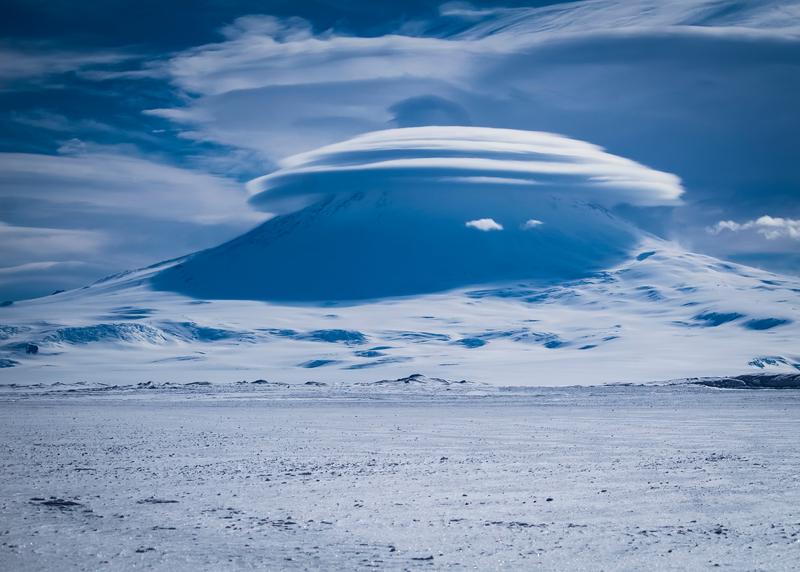 The group managed some impressive feats, including the first ascent of Mt Erebus – the second-highest volcano in Antarctica, 3,794m – and, although falling just short of the geographical South Pole, they made it south far enough to witness and record the shifting of the magnetic South Pole. 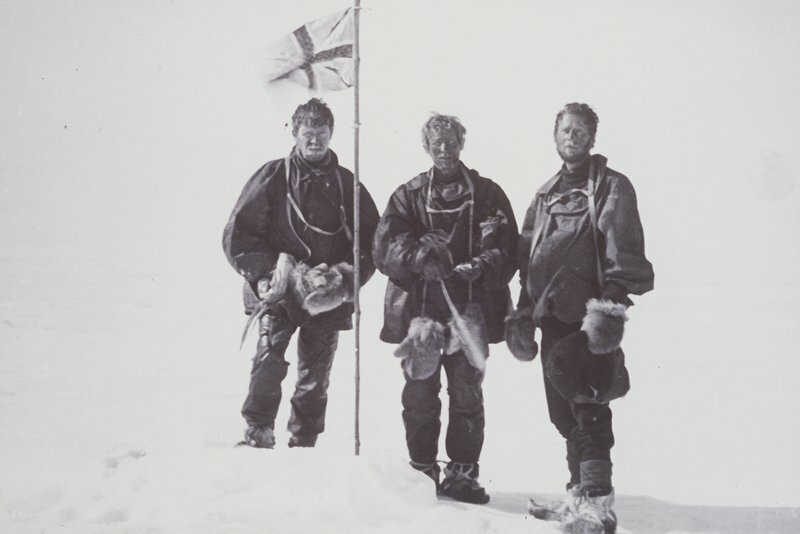 The achievement earned Douglas Mawson an invitation to join Robert F Scott’s British Terra Nova Expedition to the South Pole in 1910. Given that Australian and New Zealand had started making plans for their own scientific expeditions to Antarctica, however, Mawson turned down the offer – rather serendipitously – preferring to head his own expedition on behalf of his country. The decision would prove to be quite pivotal to his future: the Terra Nova Expedition turned out to be a tragic failure, resulting in the death of all who took part. You can read more about that fascinating story, here. One of the most impressive aspects of the Douglas Mawson-led Antarctic expedition of 1911-14 was that it was organised by nations barely a century old. The ship purchased for the journey was the Aurora, a wooden whaling ship which would go on to make several successful Antarctic expeditions and rescue missions. The journey set off from Tasmania, tracing the unexplored seas to the eastern side of Antarctica, where the group made landfall at what is now Cape Dennison, the head point of the Commonwealth Peninsula. 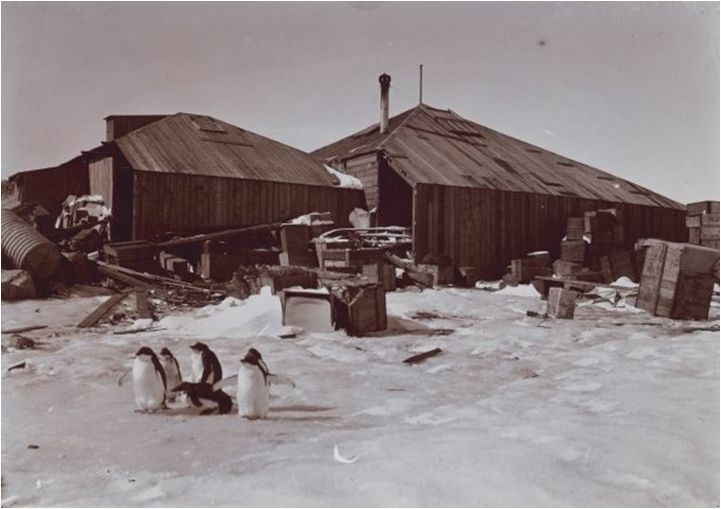 Dawson and his men made their base here, constructing huts which have now become the prime historical sites of the Australian Antarctic Division. The group spent the first winter here and many of them the second, as well. 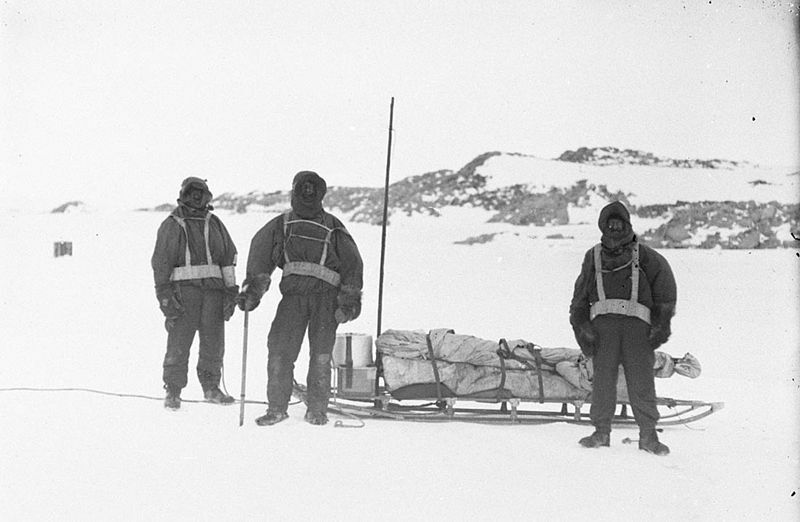 The AAE, led by Douglas Mawson, set off on extensive coastal and inland excursions on separate teams, collecting scientific data and geological samples. By the end of the tumultuous journey, this would turn out to be the best and most thorough scientific expedition that had ever be undertaken in Antarctica. 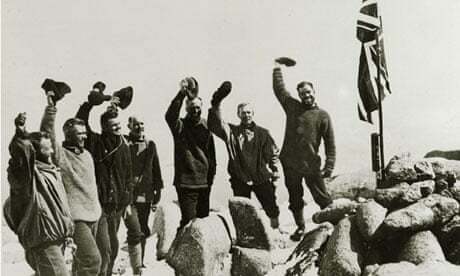 Mawson led a small team on a sledging expedition which set off from Cape Dennison in mid-November, 1912. A few weeks later, whilst making great progress, they came across a snow-covered crevasse whilst crossing a glacier. Tragedy struck as men, a dozen sled-dogs and much of the food supply they’d packed plunged into the crevasse. Only Dawson and one companion, Swiss explorer Xavier Metz, survived the initial accident yet they now faced the prospect of a return journey to base with very little food and just a few dogs. It would take almost two months for Mawson to make his way back to base, having to bury his companion a month into the return journey and surviving on very little food. The sled he pulled by hand still contained all the geological specimens the men had collected. Once back to base, Mawson realised the Aurora and most of her crew had left not wanting to get stuck overwinter in ice. Only six men stayed behind, unwilling to leave without him. When Mawson first appeared, he was in such bad shape that they didn’t immediately recognise him. A message via wireless radio (the first such radio set up in Antarctica) was sent straight away but the Aurora, due to bad weather, was unable to come back for a rescue before winter set in. The group was then forced to spend almost a whole year on Antarctica before being rescued in December, 1913. It turned out to be a great year for science as the men were utterly relentless in their pursuit of data and samples. By the time they came home, the AAE crew had carried out countless studies on this uncharted side of Antarctica: from meteorology to geology, geography and biology. Douglas Mawson’s tale of survival is one of the most impressive historical feats of all time, earning him a myriad of bravery awards from several countries. Yet the man’s humble nature and no-nonsense attitude meant he never really enjoyed the fame afforded to more boisterous explorers. Search for books, movie and documentaries about Antarctic explorations and you’ll do bout come across a myriad of illustrious names…Scott, Shackleton and Amundsen pop up immediately. Mawson, not so much. There are various reasons for this: aside from the fact that Mawson didn’t partake in the race to the South Pole and didn’t conform to the ‘fame & glory’ side of explorations, he was also an Australian, at a time when British and American press were at the forefront of news broadcasting. Every country boasted and boosted its own national heroes and Australia, back then, didn’t have much influence on an international stage and was only starting to get its foot into the Antarctica-door. Not many, at the time, realised the kind of print that foot had left. 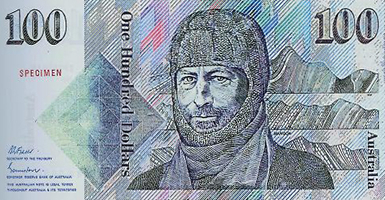 For eight years (mid-1980s to early 90s) Mawson’s rugged face graced the front of our $100 note. Most of us looked straight at him on a regular basis yet, wouldn’t you know, many didn’t even know who he is. Isn’t it time we awarded the man the credit he is long overdue? If you’re looking for an Australian to admire and celebrate, why not skip the Ned Kelly saga and look no further than the father of our country’s Antarctic history: Sir Douglas Mawson. 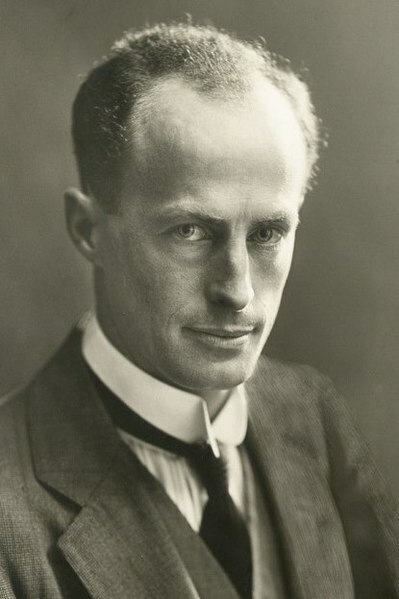 He planted the seed for what would become one of the most comprehensive and respected Antarctic scientific divisions and, whilst doing so, lived through what Sir Edmund Hilary dubbed ‘the greatest survival story in the history of exploration’. If you’re planning your own Antarctic expedition (21st century-style) get a hold of Alone on the Ice and enjoy the gripping read before you set off. It’s bound to make your experience all the more rewarding. At Chimu Adventures, we cast off every summer to explore Antarctica, with various expeditions departing Ushuaia (South America), as well as Tasmania and New Zealand – the latter exploring the lesser-visited eastern side of the Antarctic Peninsula. Contact us today to know more. Prepare yourself for the adventure of a lifetime as you board the spacious Ocean Endeavour and set sail across the infamous Drake Passage, with a course set for Antarctica. The White Continent is the world’s final frontier, a vast ice wilderness of epic proportions. Harsh and hostile, yet hauntingly beautiful, Antarctica is the ultimate destination for photographers, wildlife enthusiasts and true explorers alike.